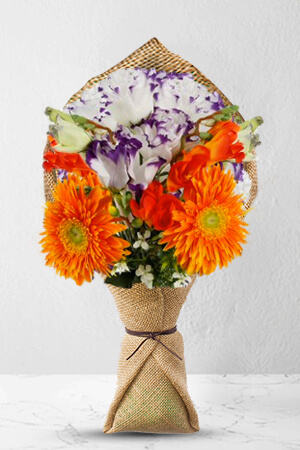 Gorgeous and delicate Eustoma, bright orange Gerberas, Freesia and a spray of seasonal flowers make this bouquet a fresh and seductive treat for that special someone you are longing for.Vase not included however, we suggest including a Premium Vase with your gift to lift the overall impression of Harmony Grace. 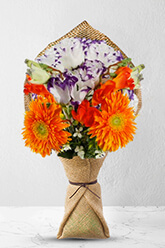 Very easy to follow web site flowers were excellent commented by the recipient. Thanks excellent service.